Geiger School at 621 South Jackson Ave, Tacoma, WA 98465 is slated for demolition and the new Geiger School will be constructed on the site. 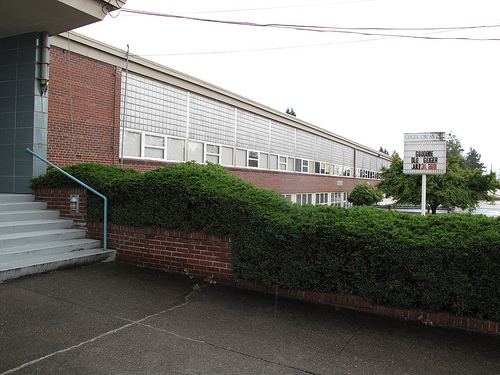 While the construction is underway, the school program will be housed at the old Hunt Middle School Building (now empty) at 6501 S. 10th St., Tacoma. The mascot for Geiger is an orca whale. The original school was built in 1949 and named after William F. Geiger who served as the Tacoma School District’s superintendent for 20 years. Geiger has been transitioning into a public Montessori program and as of this fall the Preschool through the 3rd grade will have that style of education. This entry was posted in Schools, Tacoma, WA State - Pierce County and tagged Geiger, Montessori, orca, school on July 25, 2011 by admin.